After many years of waiting, DC fans are finally going to get the live-action Justice League movie they've always wanted. We still don't know for sure if it's going to be as good as everyone hopes it will be, but fingers are crossed. As many DC fans likely know, director George Miller tried to get Justice League Mortal made in 2007 that ultimately fell apart. That movie was going to feature an epic fight between Superman and Wonder Woman, which Jay Baruchel, who was supposed to play the villain Maxwell Lord in the movie, has just dished some details on. Jay Baruchel recently appeared on the Happy Sad Confused podcast in order to promote his movie Goon: Last of the Enforcers, which serves as his directorial debut. While speaking a bit about the canceled Justice League movie, which was officially titled Justice League: Mortal, he revealed the fight between Superman and Wonder Woman, how came to be and how it was going to go down. Here's what he had to say about it. "There's a scene where Maxwell Lord brainwashes Clark and all of a sudden this guy's got Superman as a weapon. But in order for me to do this, to get in to a Kryptonian brain, I start bleeding out of every f*cking orifice because it takes that much to get into the head of a Kryptonian. And then I turn him into Red-Eye Superman, and there's this big a** fight between him and Wonder Woman where he breaks her wrists." 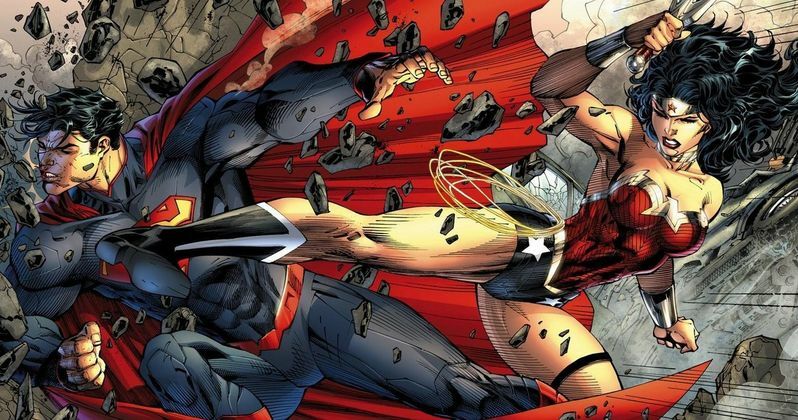 This is not the first we've heard of this fight between Superman and Wonder Woman in Justice League: Mortal. Back in 2015, some concept art of the fight leaked online that showed this very showdown. In that version, Superman was set to be played by D.J. Cotrona (Dear John) and Wonder Woman was going to be portrayed by Megan Gale (The Water Diviner). They would have been joined by Armie Hammer as Batman, Adam Brody as The Flash, Common as Green Lantern, Santiago Cabrera as Aquaman, Teresa Palmer as Talia Al Ghul, Zoe Kazan as Iris Allen and Hugh Keays-Byrne as Martian Manhunter. Sadly, we'll never get to see this crazy version of Justice League, which was canceled shortly before the movie was scheduled to go into production. Though, this did allow for Warner Bros. to rethink things and eventually give us the DCEU. Also, this movie was reportedly going to cost nearly $300 million to make, which would have made it a massive gamble. For the studio. In any case, we're finally going to see an actual Justice League movie arrive in theaters on November 17. Who knows? Maybe we will get to see Henry Cavill's Superman square off with Gal Gadot's Wonder Woman. That would certainly be something fans of the DCEU would like to see.